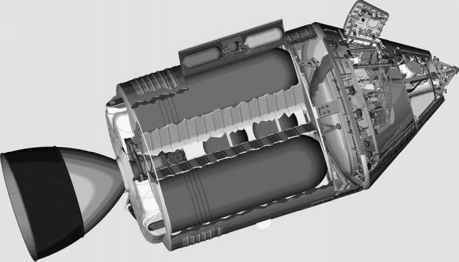 The descent orbit of the final four missions was a particularly exciting affair as the spacecraft gently descended from its 110-kilometre high point over the far side to skim across the mountain tops on the near side with a clearance of barely 15 kilometres. The northerly paths taken by Apollos 15 and 17 over the near side were especially notable for the spectacular ride they offered the crews. Descending from their apolune, these spacecraft passed over Mare Crisium then Mare Serenitatis. On Apollo 15, the smooth basalt plain of Mare Serenitatis was already lit by the morning Sun and the mountains on its western shore rose like a wall coming towards them as they gently descended across the expanse of the mare, which was so large that its curvature was readily apparent. Capcom Karl Henize, who must have been imagining the approaching mountain range, jokingly enquired about their safety. "Fifteen, does it look like you are going to clear the mountain range ahead?" Irwin replied, "Karl, we've all got our eyes closed. We're pulling our feet up.'' "Open your eyes. That's like going to the Grand Canyon and not looking.'' This range also formed the eastern margin of the great Mare Imbrium. It was within an embayment seated among these peaks that Dave Scott and Jim Irwin would eventually land. It was little wonder. The only trained scientist to reach the Moon was going to give a master class in observational geology, but coming over Mare Crisium he was just getting warmed up. "Oh, boy, there is Picard [Crater] - or Peirce, one of the two. Okay, Gordy, all those dark and light albedo changes around Picard and Peirce are not obvious at this particular angle yet. There's some hint of them.'' "Roger," confirmed Fullerton. The Apennine Bench Formation at the southeast margin of Mare Imbrium. Later in the flight, he had an opportunity to observe one of the Moon's most distinctive craters, Archimedes, located in the middle of Mare Imbrium. Archimedes is important to lunar geology because it is part of a series of lunar features that allowed geologists like Schmitt to apply the principle of superposition to construct a stratigraphic history of the region. The crater is flooded with the lavas that also filled the Imbrium Basin so it is older than the era of lava outpouring. 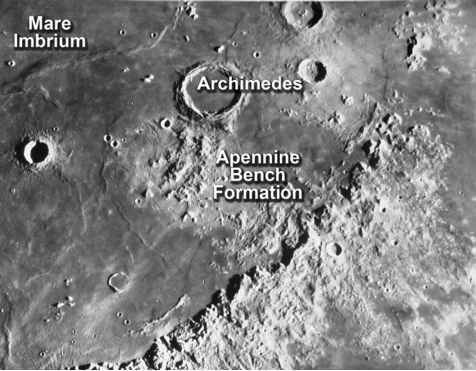 To its south and southeast is a light patch called the Apennine Bench Formation, the Apennines being the mountain range that forms the eastern rim of the Imbrium Basin, but which he referred to simply as the Imbrium Bench, that predates the crater because we can see damage from Archimedes across its surface. Finally, the bench seems to be a sheet of a different kind of lava that formed soon after the creation of the Imbrium Basin itself. Schmitt told all this to Capcom Gordon Fullerton. On and on he went, before and after his visit to the surface, providing lunar scientists with a journal of geological observations to stand for all time as the sights of the first scientist to visit the Moon.